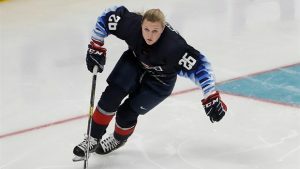 January 2019 will remain a golden month for Kendall Coyne Schofield, and a moment etched in many hockey fans’ minds for a long time to come. This comes after a stellar performance by the American women’s hockey star at the NHL All-Star skills showing, held in San Jose California on Friday, 25 January 2019. Not only did Kendall set a record by becoming the first woman to take part in the meet, but she also put in a fantastic display that had all the fans going crazy. Experts and ordinary fans knew they were on to something big right from the start of the race around the rink, going by comments from key figures, after she posted a 14.436 seconds lap. Connor Mc David, who won the competition, says he was profoundly surprised from the very moment he saw Kendall taking off. He says he was pretty much convinced that she was going to win it, before adding that it was such a fantastic moment for the competition and a landmark moment for the game of ice hockey. Kendall’s appearance at the competition was a combination of luck and exceptional talent. Her inclusion in this skating meeting came after Nathan MacKinnon pulled out due to an injury. She came on and grabbed the opportunity with both hands, by making an impression that will be hard to forget or ignore. The extraordinarily talented Minnesota Whitecaps player was not a compromise inclusion though. She was in the thick of things at the Winter Olympics in 2018, emerging with a gold medal that added to the United States’ tally. Kendall finished seventh out of eight skaters, but feels so upbeat about it and hails it as a great moment for the women’s game. She says that she felt confident about it from the start, knowing full well that speed is her main strength.